Today’s installment of Off The Record finds us in Houston, TX with Holden Rushing of The Small Sounds. I have been following Holden’s music since 2002 when he lived here in L.A., back when he would play the Cinema Bar in old Culver City. Below is Rushing’s guide to his favorite local haunts in H-town. I can personally vouch for Mama Ninfa’s…fantastico. The Orange Show :: This is a crazy place, built by an ex-postal worker over a period of 25 years in tribute to his favorite fruit. Now it’s an ever-evolving art studio, museum and live music venue. The bizarre setting adds a little something extra to some already cool shows — Bonnie “Prince” Billy, Daniel Johnston, Joanna Newsom, Vetiver, and many others have graced the stage. The Orange Show Center for Visionary Art also maintains the Beer Can House and hosts the Art Car Festival every year, both of which are totally nuts and a complete ball. 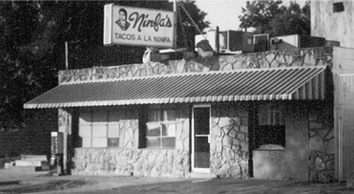 Ninfa’s on Navigation :: A Houston Tex-Mex institution. They claim to have invented the fajita, but that is sort of akin to inventing the internet or the question mark. There are those who will claim that there are better Tex-Mex joints in town (and they’re probably right), but when they have a guest in from out of town, they’ll go to Ninfa’s first. This place is part of the reason that Houston is constantly near the top of the “Fattest Cities in America” list. Honorable mention Tex-Mex joints: El Tiempo, Last Concert Café, Spanish Flowers, Pico’s. The Menil Collection :: A free museum set smack in the middle of Montrose (a funky neighborhood in its own right) housing a diverse and constantly changing private art collection. Definitely a cool place to stroll through on a lazy day. Made up of several buildings including The Rothko Chapel (interesting trivia: The Peter Gabriel tune “Fourteen Black Paintings” was inspired by the 14 black paintings on the walls in the chapel). West Alabama Ice House :: An outdoor beer joint open since 1928, and one of the best hang-outs in town on a nice day. The cross-section of people (and their dogs) that you see is unrivaled. Cold beer, free hotdogs, horseshoes, live music on the weekends, plenty of picnic tables, cool bartenders, and never a cover charge. Awesome. Cactus Music :: A classic H-town record store. Cool owner, knowledgeable staff, good selection, and a fully booked calendar of free, in-store performances by local bands and national touring acts. A good place to run into a friend (or make a new one) while browsing. + Download The Small Sounds via eMusic’s no risk 25 Free MP3 trial offer. Love these guys. Great live band too! Been catching the Small Sounds shows for the past few years in Houston. Talented band, great music, and awesome guys to boot! That pedal steel sounds deramy. This is a cool perspective to feature. Anything that melts traveling and music is great to me. I like their music. Definitely will check out more. Plus, now I’m hungry for Ninfa’s! Nice sound. A pedal steel always gets me. This Holden guy has a good voice as well. Good Pick Drunkard. Was in Houston once, missed every place on their list. Am a huge Off The Record fan. The sound of the The Small Sounds is unique and to be dug. Their sound is a mixture of pre-Long Run Eagles and modern country music if it [modern country] was actually good. great read. i was in houston for a few days in july and had quite the time trying to find a place to eat. walked around for quite some time and finally had a decent meal at the moma (i think). seemed to me at the time like it’s quite the monday to friday city. loads of churches. I have been a regular reader of your blog for quite some time, but I have to say that this is by far my favorite feature you’ve done. It kinda reminds me of what Spin magazine does, but focuses more on the places to go rather than what to listen to. I am glad to see Houston get some love, as that is where our little blog is based. The Small Sounds are great, and Rushing did a great job of filling you all in on a couple of our hidden gems across town. He is right about the Orange Show. We were lucky enough to catch Dengue Fever, Extra Golden, Mucca Pazza and Baby Dee at that most wonderful venue, and it still remains my favorite place to catch a show. Thanks for this segment. Can’t wait to see more of the same in the near future!